HomeJuly 2014Why would a woman…? Good Samaritan Sisters Sarah Puls and Bernadette Corboy reflect on what religious life means to them. In doing so, they consider some of the questions for women today who might be thinking about religious life as a ‘Good Sam’. respond to an inner urging to seek MORE in life? choose to live community with a group of women not of her choosing? place her experience, skills and gifts at the service of her community and neighbour? commit herself by vow to stability, conversion and obedience in the Benedictine tradition… for life? spend priority time in personal and communal prayer each day? open herself to the joy of a Gospel way of life that invites, challenges and prunes one’s attitudes and behaviours? Are there any young women whose hearts stir with the question: “Is there something MORE to life that I am being invited into?” This was the question posed to young women on a recent weekend with a group of Good Samaritan Sisters as they engaged together in conversation and sharing about their way of life. Embarking on the journey of religious life is as compelling now as it has been over the generations. Our congregations may be smaller; however, for us, the Gospel imperative to seek God and serve our neighbour is still an urgent call. We believe that this way of life has the capacity to bring meaning and fulfillment and deep joy in discovering the MORE along the way. BERNADETTE: “I made a decision to join the community of Good Samaritan Sisters in 1965. I was young and fairly naïve, but strongly attracted to something ‘intangible’ emanating from the sisters who taught me at school and a deeply felt desire to share something of that. There was also a resistance voiced as a ‘Nooooooo!’ from one of my sisters who thought I would be locked up behind high walls like Audrey Hepburn in The Nun’s Story! Mum and dad would have liked me to be a little older but only wanted me to be happy in my life choice. Work colleagues thought it strange. “I have found in my years of lived experience, in all its diversity of community and ministry, that the Gospel call to women religious today is as it has always been. It’s a call to a relationship with Christ, to follow him to the margins, to love those we encounter there and to risk the vulnerability that ensues from it. I have ‘lived into’ what it means to be a religious sister whose name is Good Samaritan. That in itself is a challenge – to be neighbour, to not pass by on the other side when a need presents itself. “I have been graced by the women I have lived with in community over the years and who have mentored me in what it means to be a Good Samaritan, both to the members of the community and to those with whom we minister. It has not always been smooth sailing, however. Is any way of life? Yet the diversity of age, experience and personality has enriched me in so many ways. We don’t choose who we live with, but in the commitment to be community, we endeavour to live a rhythm of prayer, supporting one another in our commitment to a disciplined, balanced lifestyle and a commitment to ministry and mission. For me this has contributed to that “hundred-fold” that Christ promised in the Gospel. SARAH: “When I began to seriously consider the idea of joining the congregation I was 28, more than 10 years older than Bernadette was, and so my experience of ‘being called’ is pretty different. I remember, before I took the first steps on my journey with the Good Samaritan Sisters, I encountered a young woman who was in the early stages of joining the sisters and she asked me whether I had ever considered religious life for myself. My immediate response was along the lines of the questions posed above… basically, “Why on earth would I?! ?” I had a wonderful full and happy life and I really didn’t see that anything was missing. BERNADETTE: “Our obedience is not ‘blind’ or about doing what we are told. Rather, it requires deep “listening with the ear of the heart” to the nudges and promptings that come from our relationship with Christ and the community members I rub shoulders with each day, to discern God’s desire for us individually and as a congregation. “Our vow of conversion of life is to lay ourselves open to transformation – not experienced as a “Damascus road” – but through the everyday niggling irritants that call us to be better than we are in our responses and reactions to people and events. “The vow of stability encourages me to live community and not just be in community with these women in the ‘now’ of life. Together we are part of something more than ourselves. We are here to support each other in the differences of age, experience, outlooks and vision of the future. SARAH: “It’s almost four years since I made my first profession and promised to live the vows of stability, obedience and conversion of life. My experience of trying to live these vows faithfully has taught me that they look and feel different every day, especially in the struggles! I think I am fortunate that I have always been guided to understand that living the vows is not something one can ever do perfectly, but that it is in the desiring, hoping and striving to do so that I am brought to life through relationship with God. BERNADETTE: “Religious life is about living our human desire and love for God in a special way. Our life cannot be lived without love; otherwise, the vows become repulsive and masochistic. The vows are desirable, but only insofar as they bring us closer in love to Christ who lived them, and in that, religious women and men find solace and true joy. Vocations Awareness Week is celebrated in the Catholic Church in Australia from August 4-10. Sister Bernadette Corboy has a background in education both in teaching and leadership roles. 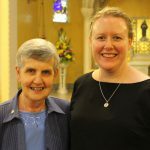 She has been involved in the formation of young women interested in membership with the Good Samaritan Sisters for many years and is is currently a member of the leadership team of the Sisters of the Good Samaritan. Sister Sarah Puls is a social worker and the casework team leader for Jesuit Refugee Service at Arrupe Place. She is also a member of ACRATH (Australian Catholic Religious Against Trafficking in Humans).